Should You Get in the Hot Tub (Time Machine)? Sometimes, it’s all in a name. 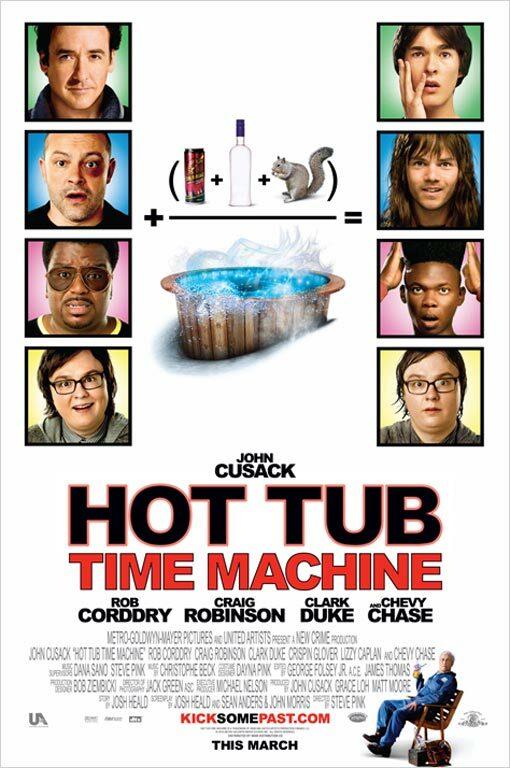 Hot Tub Time Machine, like Snakes on a Plane before it, is a movie where all you need to know is spelled out right there in the title: Four guys in 2010 go to a ski resort, get drunk in a hot tub, and wake up in 1986. That’s the entire plot, basically. John Cusack, who produced and stars, seems to be having a better time here than he did in 2012. Other laughs come from Craig Robinson, best known as Darryl from The Office, and Crispin Glover (Back to the Future). Mostly, though, Hot Tub Time Machine is a bit of a one-joke letdown (yes, I was actually looking forward to seeing this one and was expecting good things). I laugh harder whenever I watch the Eddie Murphy/James Brown Hot Tub sketch from Saturday Night Live than I did at any point during this movie. So I’m only going to give it a B–.